There are so many reasons to visit Portland: delicious food, amazing coffee, Powell’s Book Store, and some of the nicest people I’ve met in the continental United States. 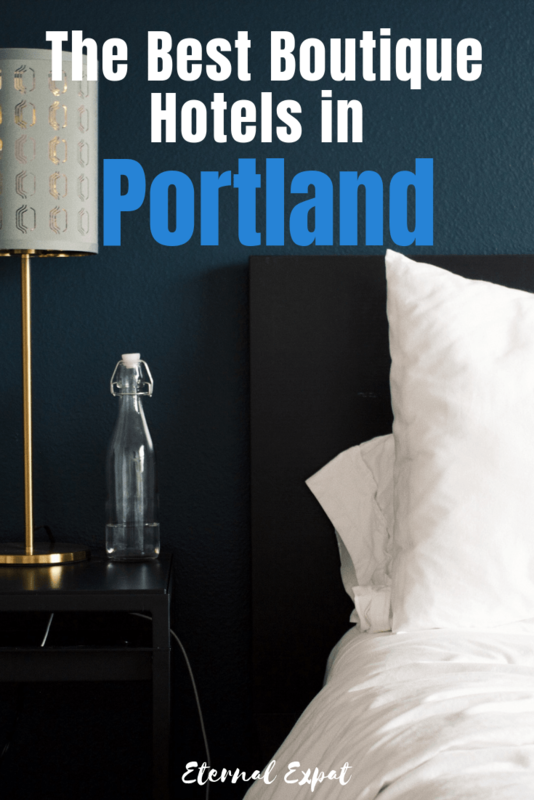 If like me, you want to rest your head in a comfortable, well-located boutique hotel in Portland, then be sure to check out these great locations that I loved (especially their cocktail bars). I tried to include a mixture of different price ranges, with one even having a hostel-style dorm room to opt for (the plushest dorm room I’ve ever stayed in). It’s also worth noting that hotels (and Airbnbs) in Portland have an additional tax added on that kind of shocked me. If you are used to these heavier taxes when traveling around the US, then you may not notice, but if you are traveling around to Portland for the first time, it’s worth noting that you pay 6% tax to the city of Portland an additional 5.5% to the county of Multnomah. While I’ve never stayed in a Hoxton Hotel, I have visited several of their bars and restaurants. The Hoxton is a chic hotel that now has locations in several US and European cities, with more opening all the time. They are well designed and are usually inside historical buildings, which they have preserved and furnished to the style of the time that the building was built (usually). The Hoxton in Portland is very cool. It has big rooms at affordable prices, with many under $100 per night. They have a huge lobby with a cafe where you can come down for breakfast and they have an awesome rooftop bar with views over the city and great tacos (why is everyone in Portland making tacos?). Book a stay at The Hoxton here. The lobby of the Hi-Lo Hotel is what I want my future living room to look like. The sea-green sofas are plush and comfortable and there’s even a swing where you can hang out. They have seriously comfortable beds and a nice selection of rooms: twin rooms, double rooms, king and queens, and suites with warming fireplaces. They also have on-site parking for $25 per day, which is not very common in hotels around Portland. The bar serves up some seriously stylish cocktails and there is a restaurant where you can have any meal of the day. Rooms start at $250 per night. Book a stay at the Hi-Lo here. I stayed a few nights in the Society Hotel and absolutely loved it. It’s well located in the downtown area near Voodoo Donuts, The Hoxton (for their top-notch rooftop bar), and there’s a very affordable parking garage just across the street. There are a few room options at the Society Hotel to suit your budget. They have small double rooms, rooms with two doubles, king rooms, and a dorm-style room with bunk beds and shared bathrooms. The bunk room is very cute, but at $40, is a bit steap (in my opinion), for how many beds are in there. However, all of the beds at the Society are very comfortable and the rooftop is awesome for sitting up and enjoying a coffee or warm summer evening. Book a stay at the Society Hotel here. I am obsessed with the rooms at Hotel DeLuxe. It’s a part of the Provenence Hotel Group which has stunning boutique hotels around cities in the US and this is no exception. The rounded beds in their romantic rooms make me so happy. They’ve managed to perfectly balance the old-school decor without making it look or feel dated. They have a full menu for room service, which I highly recommend taking part in for breakfast in bed (especially in that romantic round bed!). They also have a restaurant that does a seriously good afternoon tea and great evening cocktails which they make tableside. This place is perfect for couples or for a girl’s weekend getaway. Rooms start at $170. 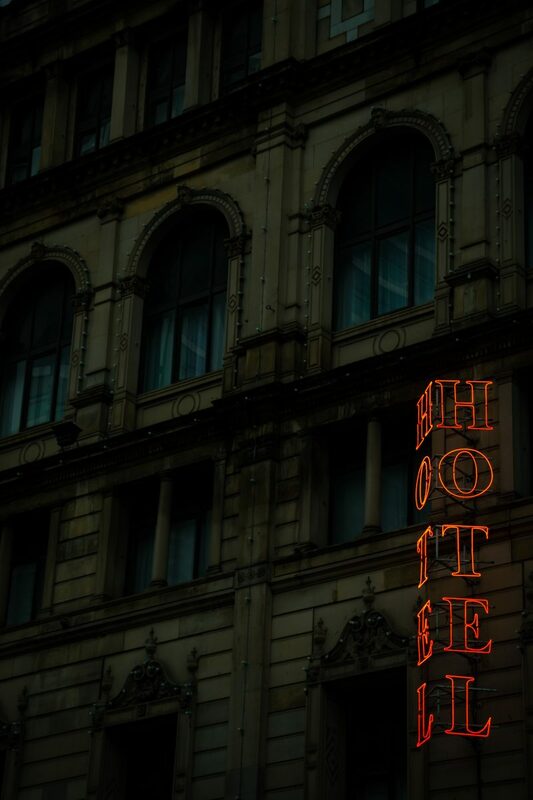 Book a stay at the Hotel DeLuxe here. If there is a better-located hotel in Portland than the Hotel Modera, then I don’t know it. It’s near the university campus. Walk out of the hotel in almost any direction and in less than a block you’ll come to a light rail station. It’s only a few blocks from the Portland Art Museum and less than 20 minutes away from Old Chinatown where you’ll find tons of great restaurants and bars. There is a beautiful outdoor patio area at Hotel Modera where you can sit by a fireplace and chill most days of the year (unless it’s raining or snowing I suppose!). The rooms are full of natural light and really spacious. The whole hotel has a sort of modern style with funky chairs and bright colors throughout. There’s also a nice bar and hotel on-site if you don’t want to travel to far for a good meal (which you never have to do in Portland, to be honest!). Book a stay at Hotel Modera here. Book lovers will croon over the location of McMenamins Crystal Hotel. It’s literally across the street from Powell’s Book Store and therefore incredibly well located for tons of great food and shopping (for more than books if you want!). I absolutely adore the decor of this hotel. It’s unique and fun with different rooms painted and decorated in mystical themes. I love the bar in the downstairs area of the hotel as well, which you can visit whether you’re staying at the hotel or not. 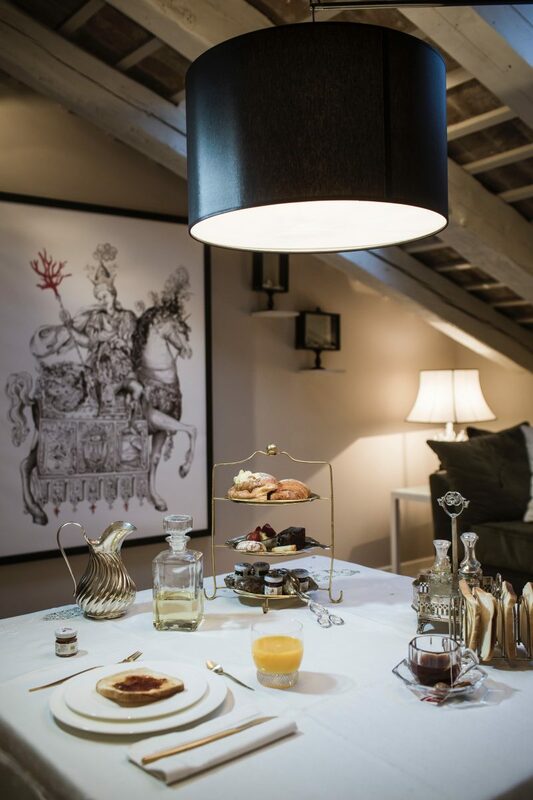 It’s definitely the best boutique hotel in Portland for those that want something a little bit different. Book a stay at McMenamins Crystal Hotel here. Hotel Lucia is a photographers dreamscape. This hotel has stunning photography displayed from the moment you enter the lobby in every spare space without overcrowding or making it feel like a stuffy gallery. Hotel Lucia was one of the first boutique hotels in Portland and continues to offer the city’s visitors exceptional service and plush rooms. They have king and queen rooms, double rooms with two queen beds, as well as a spacious suite if you want some more luxury or need some more space. They also have wheelchair accessible rooms. Rooms start at $115 per night. Book a stay at Hotel Lucia here. There are three Kimpton Hotels in Portland, but for location and style, the Kimpton Hotel Vintage Portland is my favorite of the three. The other two are Kimpton Hotel Monaco and Kimpton Riverplace. I love this one in particular because I love the vintage feel and decor of the place, balancing stylish furniture with graffitied walls. It feels like it fits perfectly with the style of Portland. The lobby and bar areas are full of oversized leather furniture that you just want to sit in all night with a cocktail. Rooms start at $150 per night. 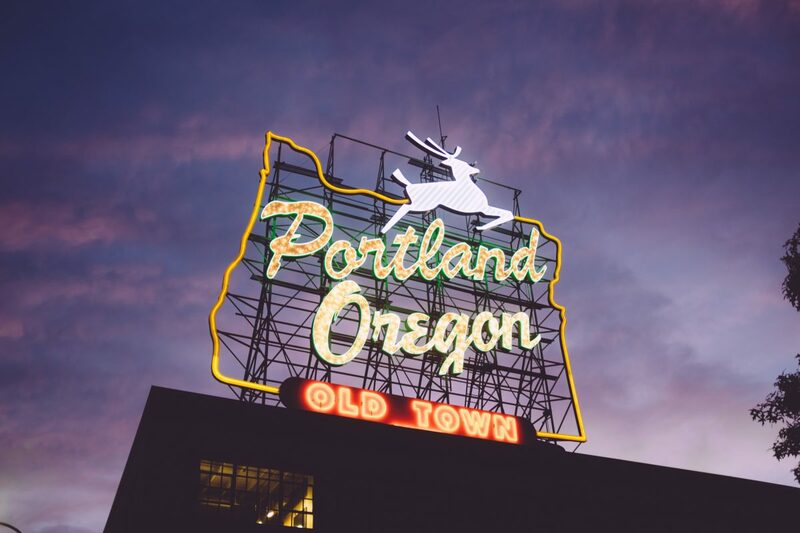 Book a stay at the Kimpton Hotel Vintage Portland here. While I try my best to stay in independent boutique hotels when I travel, sometimes (especially in US cities), the best value for money often comes from bigger hotels. The Duniway Portland is actually part of the Hilton group, but it is such a beautiful hotel in a fantastic location, I don’t think it can be overlooked when you are searching for a boutique hotel in Portland. The Duniway is right in the downtown area close to the light rail and within walking distance of Powell’s, Voodoo, and tons of great bars and coffee shops (there are endless cool and delicious places in this small city!). I really love the rooftop space here where you can chill or enjoy one of the many organized events they put on like yoga classes, wine tastings, or live music. Rooms start at $160. Book a stay at the Duniway Portland here.